dNA’s activities originate in Sota Ichikawa’s college research into spatial notation methods. In architecture, construction in real space is set as a premise, and notation methods based on Cartesian coordinates have been established since the Renaissance. Not comfortable with this notation method of describing three-dimensional space in a static and objective way, Ichikawa began to look for a spatial notation method taking a subjective and local viewpoint. Instead of Cartesian coordinates that command a bird’s-eye view and imperiously eliminate personal viewpoints and body specifics, Ichikawa adopted polar coordinates, which enable the depiction of all-directional, bottom-up viewpoints from autonomous individuals. Seen in polar coordinates, equal space is not provided for all people, but dynamic space appears according to individual behaviour and perceptions. There are multiple ways to grasp the world. Employing an alternative (i.e. polar coordinates), challenges the conventional concept of space and the various systems based on that concept. Humankind has invented many different rules and systems in all fields – politics, economics, science and technology, arts and culture – and they have spread across the world. Especially since dawn of the modern era, in the age of rapid globalisation, such rules and systems were essential for the efficient unification of society. Placing itself apart from a spatial notation method that is considered self-evident, dNA explores new possibilities for depicting the world. This action is not a mere denial of the conventional notation method, but it provides us with leeway to distance ourselves from a unified understanding of the world, and shows us layers of the world that are still potentially malleable. dNA’s understanding of space starts from a new “reality” (time, space, and eventually the self) that has been generated since the mid-1990s by the quickly spreading information environment of the Internet. 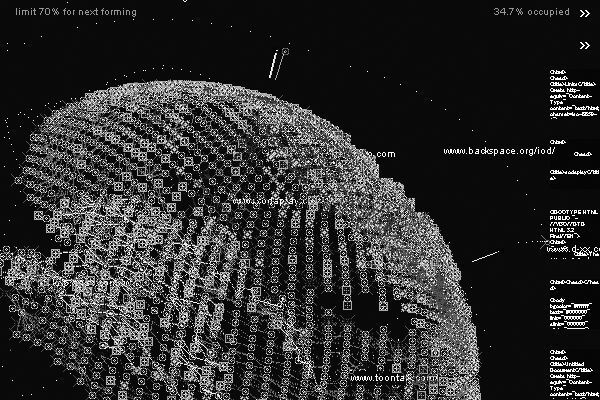 In 1991 Manuel DeLanda stated that self-organising processes occur on the Internet (similar kinds of process can be seen in nature, such as order restored from chaos), while Friedrich Kittler said in the mid-1990s that “the Internet is an emanation”. In the information networking environment, what would be effective is not a Cartesian viewpoint that looks down on and frames the world (observing from the outside), but a viewpoint in polar coordinates: one in which a subject or an observer jumps into the world and interacts (observing from the inside). In the 21st century, when all sorts of information from the public is linked and shared through the network, the existence of a self-organising and interactive world has become a reality. The absolute concept of space is faltering, and more connective space is now open, in which real space and virtual space are connected and individuals mutually affect each other as part of that space. Departing from the absolute viewpoint and generating the world from individuals’ spontaneous involvement was foreseen in Jacob von Uexküll’s concept of “Umwelt” (a specific universe that is fit for a living subject’s own structure: Jakob Johann Baron von Uexküll, 1864-1944). His worldview was based on differences and networks, in which each living organism lives in its own universe, each existing side by side with others, with a collective of such networks being called “the world”. Uexküll considered an ecological system to be a network of information woven by the relationships of various living subjects. In a contemporary society equipped with the Internet environment, his interpretation can be expanded to include information agents. As for dNA, their “Super eye” program, which supports individual viewpoints, conforms to the above concept; a number of information agents, while having their specific views, are mutually networked and related like a swarm of insects. This is a world that is grasped not by humans as subjects, but by information agents which generate and transform it. The reason why Ichikawa chose polar coordinates is that he thinks of the relationship between individuals and the world (not to mention architecture) as one of succession. In this notation method, which conforms to the three-dimensional, the centre of the subject’s head is the zero point, and other points are mapped on a sphere. What is viewed and noted from the zero point is perceived through the body and is extended to the outside. In Ichikawa’s earlier research, entitled “Smooth compound eye Super eye” (1995-), a perspective based on polar coordinates is realised by his own “Super eye program.” What is viewed there is not a perspective seen from one’s eyes (where an absolute subject is presupposed), but a post-hierarchical world, seen from a virtual zero point (the “self”), open to all directions, as figures are plotted on a virtual sphere reflecting the surrounding environment. In the work “2 Skins – Architecture without building” (1998) by dN (doubleNegatives), one’s body (formed by its outer skin, with the zero point at the centre of the head) and a map of the world (zero point at Tokyo) were plotted and shown in both static and moving images. As the title suggests, the subjects described are the extended skins originating from a human (both human skin and that of the world). In polar coordinates, priority is shifted from vision-oriented Cartesian coordinates to more touch-oriented perception. How space is seen through the experiences of an individual existing in the world as shown in “2 Skins” seems related to J. J. Gibson’s Affordance Theory, as posited in “The Ecological Approach to Visual Perception” (1979). A transforming condition in which an individual existing in the world (participant, Super eye) sees (or receives the world as it seems on the surface) and perceives the minutely changing surrounding environment and interacts with it is latently programmed; dN extended this into virtual space. In polar coordinates, multiple subjects – each having his or her subjective viewpoint – perceive the world based on differences in body, perception and movement, and form space and environment to share them from the bottom up. Such interactive elements were employed together with three-dimensional sound in “dqpb: dynamic quadruple phonic building”, with architect Mitsumasa Yuki and musician Mai Fujinoya (Kankaku Museum, Miyagi, Japan, 2000). (Graphic designer Kaoru Kobata participated in all subsequent graphics projects.) In this work, a virtual ball of sound bigger than the real space (with a diameter of 15 metres) is presupposed. Each of two participants freely transforms the sphere by using a ring-shaped interface, and experiences the movement of this dynamic sound. Ichikawa describes what dN aims at as “architecture as measurement of space”, and here “space” extends to cover domains that are physical, mental and on the network, and can be interpreted as something in which the above elements are mutually linked. Measurement and notation are conducted automatically via Super-eye; the architecture that is visualised changes according to individual bodies, perceptions and behaviour, and space is perceived likewise. 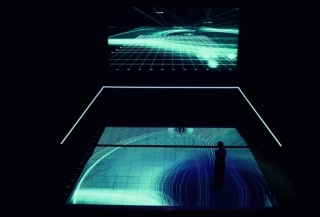 Around the same year, dN presented a work based on the idea of polar coordinates on the Internet. 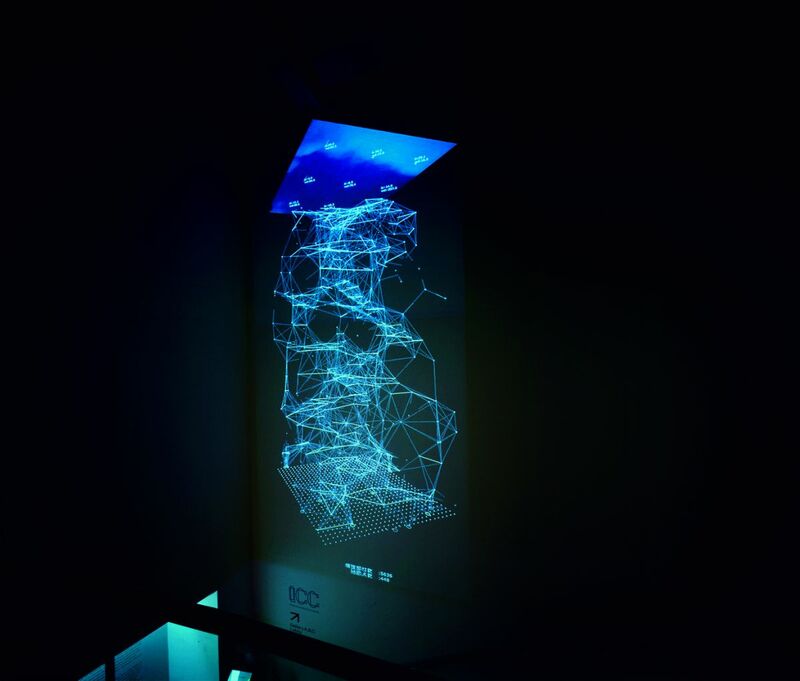 In their “chain abstract value field” (online project “Protocollision”, 2000), created with graphic artist dextro, trace routes on the Internet were used, and a three-dimensional structure was visualised from computer IP addresses passed through when a site is accessed. 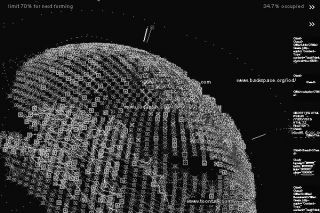 In their “plaNet Former” (Shiseido Net Gallery CyGNet, 2002), the process of how information agents wandering around the web travel along a page’s links is shown as a spherical planet formed in real-time. Both works visualise structure emerging fresh from the Internet. 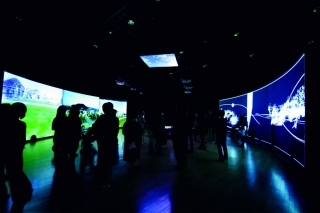 The interactive space-measuring work of “dqpb” was further developed as “gravicells – gravity and resistance”,1 a collaboration between Ichikawa and media artist Seiko Mikami in 2004.1 Visitors to this large-scale work experience gravity interactively as “forces of attraction between matter”, as well as the forces repelling them in moving images, sound and light. Participants enter a space ruled by orderly projected lines, with distortion caused by multiple entrants transforming the space dynamically. In addition to the participants’ movements, GPS data in real-time measuring the position of the site (measuring points from outside the earth) are added as Super eye, and they influence the changes in the space. The very site of the installation is assumed to change constantly due to the high speed of the earth’s rotation, and datum points of the GPS (outside observers) as well as participants (inside observers) are related. In this work, what is important is that which is outside the perceptible realm of such features as lines on the floor and light (i.e. information latent in the whole space). While information processed by measurement is ceaselessly changing, part of the information is supposedly exposed like slits, and made visible. Perception is aroused in not only what is visible or within the installation space, but rather through the work we realize anew that various interactions are endlessly occurring in this world. “Architecture” realised by spatial measurements begins to be related to the world, which is filled with incessantly changing information. The Corpora project started in 2004. Their first version, the first to be released under the name of dNA, was “Corpora.proceed(sky)” (”open nature” exhibition, NTT ICC, 2005). 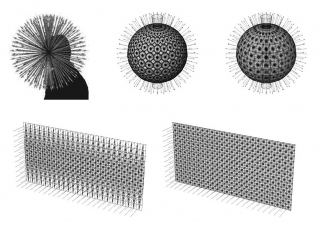 Data was taken for the first time from the natural environment (ubiquitous and ceaselessly changing in its nonlinear properties), and architectural experiment/ experimental architecture was applied to determine the architectural form. The sky was filmed in real-time, and its brightness and the movement of clouds was observed to provide information on wind velocity and direction. Reflecting such data, a wire-framed, three-dimensional, virtual “architecture” continuously expands and contracts like a living creature. As relationships of structural nodes in the wire-frame are mutually adjusted as viewpoints on polar coordinates (Super eye, a collection of cell-automata, each of which has its own subjective viewpoint), the form is generated and changes. Each Super eye takes in data and scans in all directions, autonomously judging the environmental conditions, and the array repeatedly multiplies or declines as they search for the position of the space. As a corpus is formed by such processes, different sources of input (geographical, climatic, artificial conditions, etc.) are possible. ”Architecture is an intelligent corpus, a reflection of the environment surrounding itself. This mutual situation is maintained by continuous spatial measurements which form the core of architectural meaning.” (dNA)2 Starting from given spatial notations in “2 Skins”, and going through interactively transformed “architecture” via participants in “dqpb”, a state of “architecture” is asserted which changes ceaselessly as it reflects its environment. Input from nonlinear nature and environmental elements opens “architecture” up to the indeterminate quality of nature, and interaction here is not limited to specific individuals or their arbitrariness. After several exhibitions, the Corpora project was developed further as commissioned by the Yamaguchi Center for Arts and Media (YCAM) in 2007, as “Corpora in Si(gh)te (CiS).” About forty devices with small sensors were scattered around YCAM, and aspects of environmental data at each point (temperature, wind velocity and direction, noise, etc.) 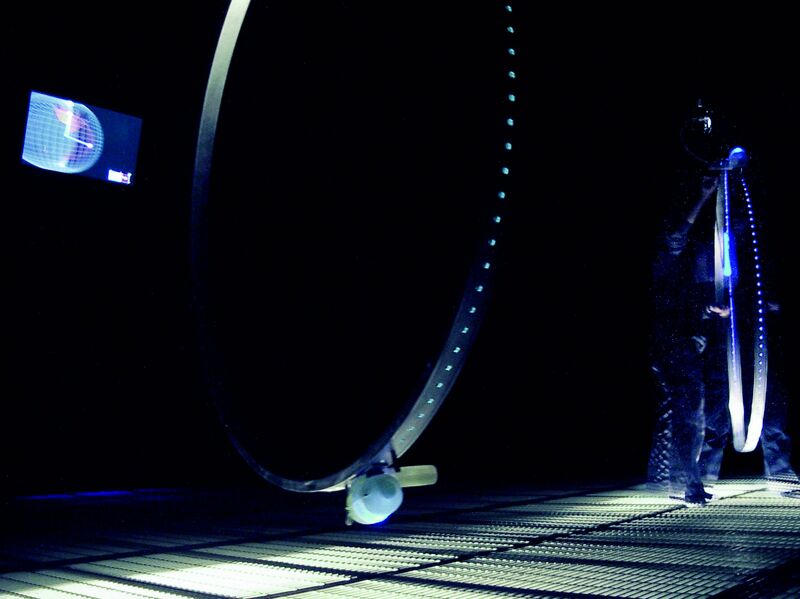 were processed in real-time via a wireless mesh network. In “CiS”, with data from sensors scattered around a vast outdoor space forming a network, “architecture” appears as a body of data gathering environmental elements. This aspect can be assessed from the view of “Cybernetics” (Norbert Wiener, 1948), which looks at various phenomena from the perspective of information communication and management going beyond society, language and life. The work also resonates with “Cybernetic Eye” by Gregory Bateson, who, under the influence of Wiener, looks at processes of mapping, translation and conversion at each step of a process.3 Both parties pay attention to an exchange of information not in terms of meaning but as signs and contexts. They also focus on the mechanism of information alternating between chaos and order, and most of all the borders of information themselves, which are always blurred. Environmental data is perceived by sensors in “CiS”, and Super-eye’s judgment at each node is networked so that the whole corpus appears. While each point is autonomous and remote, all are networked to appear as one living organism. This corpus can be considered one of the prototypes of what Bateson calls mind. Bateson’s mind can be seen as having expanded into computer networks since the 1990s. DeLanda (among others at the time) discovered the self-organising nature of information, and by adopting the concept of the “machinic phylum”, considered the distinction between organic and inorganic life as ambiguous.4 In this context, feedback made by individual autonomous communication (the concept Wiener saw as important in Cybernetics) is at work. The same thing applies to living organisms. Complex systems scientist Kazuyuki Aihara talks about “Dynamic Output Feedback Synthesis”, in which each nerve cell makes mutual links and contributes to a structural network in a living organism.5 Super eye, as a parallel and decentralised information processing system, makes internal connections and provides internal feedback to support the Corpora whole. A dynamic connection (pointed out by Aihara), in which mutual input via a network creates new patterns of output, is not as complex as an organism, but it is viable in the case of Super-eye. The dynamics, which do not happen with a single organism, appear when multiple elements are involved, and bear fruit as Corpora. Close examination of fluid processes rather than substance, which is significant in CiS, is a phenomenon seen especially around the beginning of the 20th century and in the 1960s.6 In the 21st century, by acquiring a natural informational layer called a computer network and combining digital and analogue, this tendency has expanded as never before.7 Most of such phenomena go beyond the systems and formats of art and architecture, which since the beginning of the modern era have been based on substance. Instead, they positively take in indeterminate phenomena found in nature and living organisms, such as climatic changes, behaviour of living bodies, and data in an organism. This can be called a challenge to free the world from human-centred policy and adopt the more open, complex and varied condition of nature and life. CiS is unique in that it confronts an unexplored area of architecture (beyond the frontiers of binary opposites such as nature vs. artifice, substance vs. information, and form vs. lack of form), by channelling data taken from nature and the environment into an autonomous organisation through the program. A changing architectural array connects dynamic patterns in the real environment with data-space, and becomes a dynamic phenomenon itself, with unevenly distributed “nothingness” around the border: amorphous, amodal and atopos. CiS seems to be analogous to a living organism such as D. discoideum (an widely known amoeba – pf) , the research subject of biologist Kumagusu Minakata (1867-1941), in that it exists in the domain between plants and animals, and it changes its form flexibly from an individual to a population according to the environment. CiS may also be parallel to a “rhizome”, as defined by Gilles Deleuze and Félix Guattari: “A rhizome does not begin or end, but is always in the middle, between things, inter-being, intermezzo.” What is challenged in CiS is to perceive non-substantial fluidity itself and give it a perceptible form, to create and visualise constantly fluid “architecture” from something formally unrealisable as architecture or structure. dNA’s architecture appears as something beyond human will and rationality. CiS is open to subtle changes in nature and exists around the border territory between the analogue and digital, real space and virtual space. Its body changes like that of a living organism. CiS can become the interface between nature and ourselves by taking in aspects of the world and self-organising them. This “architecture beyond architecture” goes beyond human perception and visualises the constantly changing world. How does it reflect sensitive informational features in Venice, in which the natural and artificial get tangled in a complex way, and how does it reverberate with us?